Theresa May's decision to call an early election in the UK can hardly be described as a gamble. With the Conservatives 20 points ahead in the polls and the Labour party led by a grumpy old Marxist, even a bad campaign should see her returned with an increased majority, a mandate for her premiership and her Brexit policy, and a five-year cushion before the next election. This avoids a more dangerous election in 2020. May took over the leadership of the Conservative Party almost by accident. It was the Laurel and Hardy-style routine of Boris Johnson and Michael Gove that let May slip in almost unnoticed. The willingness of Gove to skewer Johnson and his subsequent failure to take the leadership proved the old adage, he who wields the knife never wears the crown. It is a proverb that the Fine Gael leadership contenders Leo Varadkar and Simon Coveney seem to have taken to heart. Maybe it's their private schooling, but they seem exceedingly polite and patient in giving Enda Kenny the "time and space" to determine the nature and timing of his own departure. Do they not realise that leaders don't hand over office willingly? Kenny will stay until he is pushed. Their patience is based on a proverb that doesn't stack up to experience. Those who wield the knife often wear the crown. You need only look back to Michael Noonan's coup against John Bruton. Noonan took over the leadership after he moved against what was seen as Bruton's anaemic leadership. Noonan didn't get to wear the crown for very long, but it was the voters who made that decision, not Fine Gael. Against an equally tough and tenacious opponent as Kenny, Albert Reynolds successfully stood against Charles Haughey. Although Haughey's career was coming to an end, and he had been wounded by his former minister Sean Doherty's revelations about Haughey's knowledge of the phone-tapping affair, wounded lions are often the most dangerous. Bringing him down where many others had tried and failed, Reynolds won the leadership of Fianna Fail and the office of Taoiseach. Haughey himself wielded the knife against Jack Lynch, and took the crown. Micheal Martin also stood against a party leader and sitting Taoiseach when he took on Brian Cowen, bringing his calamitous premiership to an end. Even in a party with a fetish for loyalty, Martin was not punished, instead he won the Fianna Fail leadership. Varadkar and Coveney seem to be misremembering another coup - one they were involved in. The coup to remove Kenny in the summer of 2010 failed. It failed because it was poorly planned, and was barely executed. The leader of the coup, Richard Bruton, was seen politely sipping tea with his wife on the weekend he moved against Kenny, not shoring up the support he should have already canvassed. Coveney and Varadkar are both doing the ground work. Varadkar is famously love-bombing TDs and senators with pizza and beer. But both are sitting on their hands regarding Kenny. The lesson they should take from the failed coup is that when you move to take someone out, you need to make sure of it. Both men aspire to leadership of the country, but neither is willing to show leadership on the removal of Kenny. Kenny has so far successfully framed the argument that, with the threat of Brexit, his experience and connections are more necessary than ever. You could frame it a different way: his remaining slows down Ireland's response. The political system is hampered by the state of purgatory we're in, waiting for a successor. We can criticise Reynolds for many things but he showed leadership in his willingness to take on Haughey, and later take risks on Northern Ireland. Equally Kenny is heavily criticised, but he is ballsy enough to resist the polite suggestions he might depart, even though he led his party to a disastrous election last year. If neither Coveney nor Varadkar have the balls to take on Kenny, we must question whether either is suitable for the office of Taoiseach. Coveney is thought to have made ground in his campaign to take the Fine Gael leadership with his work on water and housing. However neither outcome can really be regarded as a success. These are messy compromises that merely achieve agreement. If he really believes that they are bad policies he could call the opposition out on this. Varadkar hardly looked the future Taoiseach last week when he appeared not to be aware of or have an opinion on the decision to allow the Sisters of Charity to maintain ownership of the National Maternity Hospital and put it under religious control. The two men look less and less like leaders of a country, but timid and calculating politicians waiting for leadership to come their way. Political leaders take risks. That's what makes them leaders. That's what makes things happen. Those risks shouldn't be suicide missions, but dispatching Kenny to a comfortable retirement is hardly such a mission. 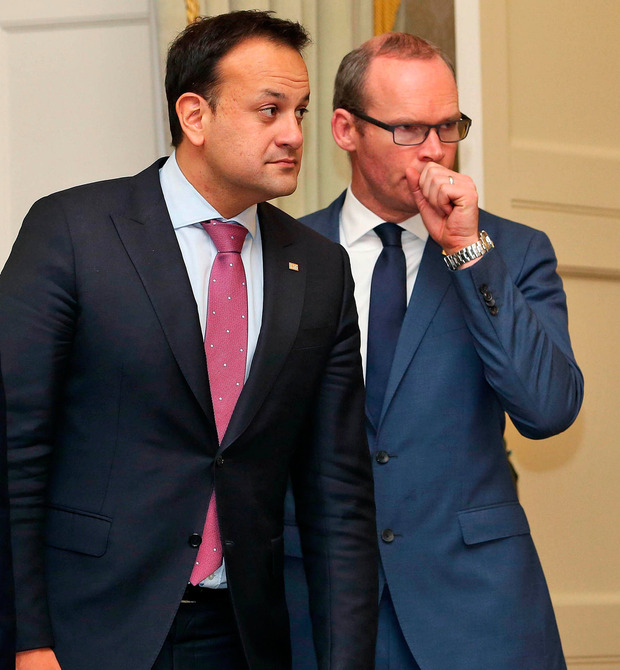 Coveney and Varadkar are waiting for something to happen. They want a Theresa May-style one-way bet. If neither wants to take risks, maybe Fine Gael should consider looking to someone else. Eoin O'Malley is director of the MSc in Public Policy, School of Law and Government at Dublin City University.